Family films stink. People that make them have no idea how children think, and typically dumb down the films so they are "family" in that they are inoffensive. What they need to learn is that children have wild imaginations. They can handle things that may not seem suited to them if presented correctly. Tim Burton knows this. He is one of the most imaginative directors working today, and although Tim Burton's Corpse Bride is about a man who marries a dead woman, it is a something rare in today's marketplace; a good film the entire family can enjoy. The premise is macabre, but the entire story is heartwarming, and even cute at times. And Burton (Charlie and the Chocolate Factory, Big Fish) is one of the few people who can pull this off. Burton co-directed the film with Mike Johnson. Burton's name comes before the title to ensure that people can see what this is. People know they can expect something special from Burton, and this is no exception. 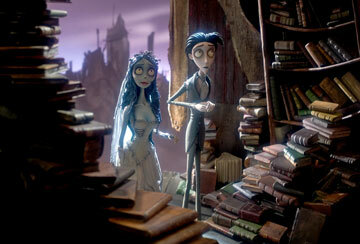 Burton and Johnson filmed Corpse Bride using stop-motion animation. This is a meticulous process where the crew constructs models, and poses them. The camera snaps one frame, then the filmmakers change the pose slightly, letting the camera take another frame. It is a time-consuming process, but the result is true three-dimensional movement not possible using traditional or computer animation. And this movie is pure eye candy. The stick thing figures with exaggerated features achieve an eerie, otherworldly look that is just a bit creepy, but not enough to be scary. It's mind-boggling to think of the amount of work Burton and Johnson put into making the film, getting all of the figures to move and speak properly. Remember, everything is a model. So when small things like a bouquet of blue flowers, or a library filled with dusty books appears on screen, one has to realize that all of this is a scale model. The detail put into these models is simply gorgeous. Paradoxically, the living world is drab and lifeless, whereas the city where all of the dead people "live" is vibrant and full of color. The one drawback to all of this is that the screenplay, by John August (Charlie and the Chocolate Factory, Big Fish), Pamela Petter, and Caroline Thompson (Buddy, Black Beauty) takes a while to get started. Even though the film is short, the pace is a bit leisurely in the beginning. By the halfway point, things are much better, and everything becomes surprisingly emotional. Another important contributor is Danny Elfman (Charlie and the Chocolate Factory, Spider-Man 2), who contributes some moody piano-heavy music, and a few catchy (but not quite memorable) songs. The plot revolves around Victor Van Dort (voiced by Johnny Depp, Charlie and the Chocolate Factory, Finding Neverland), who is about to marry Victoria Everglot (voiced by Emily Watson, Equilibrium, Red Dragon). It is an arranged marriage, although both believe in true love. There is a fairytale quality to the characters, and Van Dort's parents are loving, while Everglot's parents are penniless and greedy. They want the marriage to get the Van Dorts' money. Van Dort gets cold feet at the rehearsal, and runs off into the woods. Feeling ashamed, he practices his vows, and places the ring on what he believes is a branch. 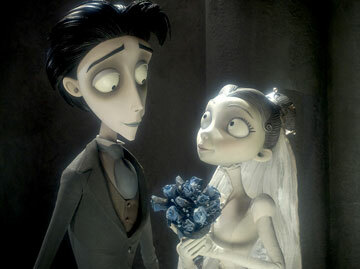 It is in fact the hand of a corpse, and the Corpse Bride (voiced by Helena Bonham Carter, Charlie and the Chocolate Factory, Big Fish) rises to claim him as her husband. Van Dort is horrified, and spends the rest of the movie trying to figure out how to get out of the situation. It's fairly easy to see where the story is headed, but Burton infuses the story with a lot of warmth and heart. 1 hour, 14 minutes, Rated PG for some scary images and action, and brief mild language.